For Cub Scouts, Boy Scouts and Teens. Patriots’ Path Council offers so many fun activities throughout the year for Scouts of all ages. Get outside of your regular meetings, and join us at one or more of these great programs. Many of them are designed for dens, troops, crew. Some are suitable for the entire groups and and others are also available to individual Scouts and families. This is a great activity for all Scouts and their families. 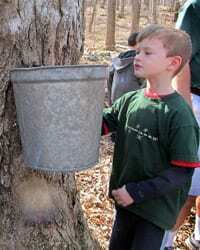 Follow the process from tree tapping to gathering maple sap to how syrup is made. 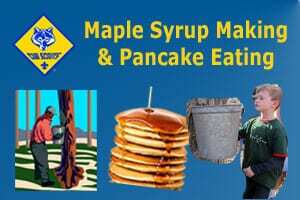 Top off the experience by making and eating all the pancakes that you want, topped with homemade syrup! Fee is $55 per group of up to 15 people. Additional youth 5 or older or adults are $3 each. Maximum number of people per session is 50. Optional patches may be purchased at the event for $3 each. Fees must be paid in advance. Sorry – no refunds for this program. Dates: Saturday March 9, 16, 23, 30; Sundays March 10, 17, 24, 31, Three 90 minute sessions each day. Contact Tom Stoddard at 973.765.9322 x 413 or 973.347.5428 to reserve a time and place for your group. Looking for an adventure? Whitewater Challengers package price of $69/person includes; camping on Friday and Saturday nights; Family Style Whitewater Rafting on Saturday (with wetsuits, if needed); a river lunch; Saturday afternoon & evening entertainment; & a Whitewater Challengers Scout patch and certificate of achievement! This promises to be a GREAT event. See you there! Register directly with Whitewater Challengers at: www.whitewaterchallengers.com Or call 800-443-8554. Make sure to mention Patriots’ Path when registering. Registrations should be done by the unit although individuals are also welcome to attend. Click to register online. Click for flier. -14, 2019. For only $49.00 per person, this weekend includes: two nights of camping under the stars; a movie both nights; a tour of Eckley Miners’ Village, a local historic coal mining village (shuttle included); bag n’ go lunch; games and competitions; a nature show; group campfire and a Whitewater Challengers Scout patch and certificate of achievement! Interested? Click here to check out Challengers website: or call 1-800-443-8554 to register or for further information. Be sure to mention “Patriots’ Path Council, BSA” when making your reservation. “It’s the most fun you’ll have all year!” Click for flier. The annual Robert Tunnell Fishing Tournament will be held at Winnebago Scout Reservation on May 11, 2019. Open to registered Cub Scouts, Boy Scouts, Venturers, and their parents. Enjoy a great day of fishing on Durham Pond at Winnebago Scout Reservation. Prizes will be awarded for largest fish caught! Registration is now open at https://scoutingevent.com/358-2019RTMFT. All Scouts and Leaders will be invited on the field for a pre-game parade and remain on the field during the National Anthem. Upper Box Tickets Start at Just $8.50 For All Opportunities! Mt. 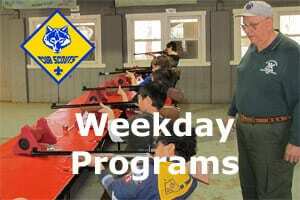 Allamuchy Scout Reservation offers a variety of 1½ – 2 hour programs to Cub Scout and Webelos dens after school on any mutually agreed upon day and start time during the dates indicated below. Come SEE FOREVER at One World Observatory. Start at the top of the tallest building in the Western Hemisphere, where you can truly feel the city’s invincible spirit! 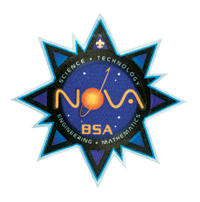 The package includes a Limited Edition OWO Scout Patch and a ticket to the Observatory. We have several historic trails that let Scouts explore New Jersey’s rich history. Several historic trail hikes are suitable for Cub Sco uts. Victory Trail -pick your own date to hike this historic 13 mile urban trail from Elizabeth, NJ to Springfield, NJ. The route follows the British advance into New Jersey that was stopped at the Battle of Springfield. View the trail map Complete the hike questionnaire and order medals online. Allamuchy offers a guided weekday or self-guided weekend 4-5 mile hike and a shorter historic site hike. For more information, visit http://www.kean.edu/libertyhall/visit/cub-scouts or call 908.527.0400. JFBB has many dates for Scout Sundays from December through March. 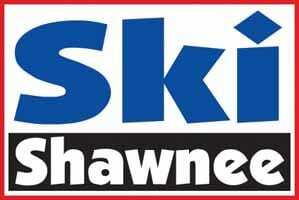 Pricing for groups of 15 or more includes lift ticket, lessons and rentals. For more information, click here for flyer. 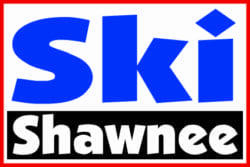 Shawnee Mountain continues to offer these great events to Scouts of all ages in 2019; Super Scout Sunday on February 3 and Scout Weekend, March 9 & 10. The best Scout discounts of the season; buy advanced tickets to save more. New, free activities for 2019! Click here for more details. We have several historic trails in our council area that let Scouts explore New Jersey’s rich history . Jockey Hollow Trail has a 10 mile Boy Scout trail at Morristown National Historical Park. Check out the Scouting Activities webpage at Jockey Hollow NHP. Victory Trail -pick your own date to hike this historic 13 mile urban trail from Elizabeth, NJ to Springfield, NJ. The route follows the British advance into New Jersey that was stopped at the Battle of Springfield. Mt. Allamuchy Scout Reservation offers a variety of 1½ – 2 hour programs to Cub Scout and Webelos dens after school on any mutually agreed upon day and start time during the dates indicated below. Visit the Camping page for Weekday Programs. Saturday programs are available to groups who are camping for the weekend or for day trips. A few programs are also held Sundays. Classes and programs are either scheduled, self-scheduled or available upon request. Most are suitable for Cub Scouts and Webelos; and a few are for Boy Scouts only. 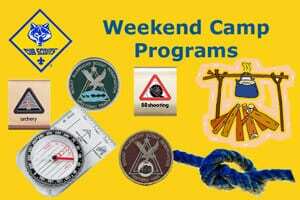 Visit the Camping page for Weekend Programs. We have several historic trails in our council area that let Scouts explore New Jersey’s rich history. Several historic trail hikes are suitable for Cub Sco uts. Jockey Hollow Trail has a 5 mile Cub Scout trail at Morristown National Historical Park. Check out the Scouting Activities webpage at Jockey Hollow NHP. 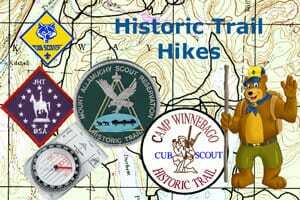 Winnebago has a Cub Scout historic trail – 2 miles.